A transgender boy in Texas who was forced to compete as a girl by the state’s high school athletics oversight organization won the state competition this past weekend. Beggs was unbeaten in 52 matches this season and sailed through the state tournament in the 110-pound classification. Mack Beggs announced that he was transitioning two years ago and has been documenting his transition on social media since. He asked to compete as a boy, but the University Interscholastic League (UIL), which oversees high school athletics in public schools in Texas, said he had to compete as the gender listed on his birth certificate. This past year, though, other parents and coaches began to notice how strong he was becoming, partly as a result of hormone therapy. One parent, attorney James Baudhuin, sent a certified letter to the UIL asking them to make Beggs compete as a boy. Baudhuin is now suing the UIL. 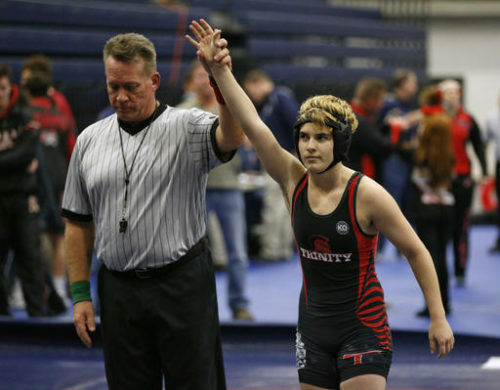 Beggs’s gender identity and the UIL’s decision dominated discussion at the state tournament, where there was a larger media presence than normal for a high school wrestling tournament. Beggs was booed by other parents and students, and Beggs and his family were kept off the main floor outside of the moments he was actually competing for his safety. “School put a safety net on us,” said Nancy Beggs, Mack’s grandmother. Beggs has one year left of high school eligibility.